Almost always solitary, her sculptures–no matter how small–have a monumental aspect derived from powerful, classic poses. She has said that she began sculpting women not only because female models are much more common, but also because she rebelled against the sensual, sexualized women sculpted by male artists. Finke’s expressive surfaces capture the process of modeling, and are the result of a long additive and subtractive process working direct in plaster, which is then cast in bronze. 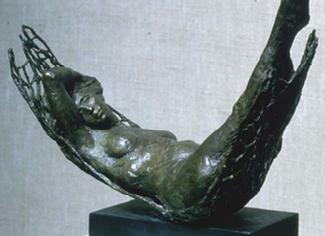 This entry was posted in Women Sculptors. Bookmark the permalink.